Use Sound For a Myraid of Vibrational Benefits! "The Music of Love It is a great Valentines day article music%20of%20love.docx"
"I want to submit an article for consideration in Om Times magazine. Do I submit it here??? " "Yes you are correct about the word levitation thank you for noticing and correcting?? Jill Mattson: Artist, Musician, 4X Author, Expert/Composer in Sound Healing! International Awards: Best Book & Sound Healing CD 2016, Best CD…"
"Interesting, Jill - thank you and I think we have your Bio paragraph (but please let me know if you have a newer one, just in case--it should accompany each one you provide). Also, I think you mean for the last word in your title to be…"
"One of the most powerful tools for enlightenment and awakening is sound. It is a vibratory jackhammer for change. We must gain awareness of this powerful tool and use it to awaken the planet. Please, consider a category for sound healing! Hugs J"
"Sound healing! This is an incredible tool for lifting consciousness. We must awaken to this readily available power. Hugs j"
"Thank you and sweet music to you! 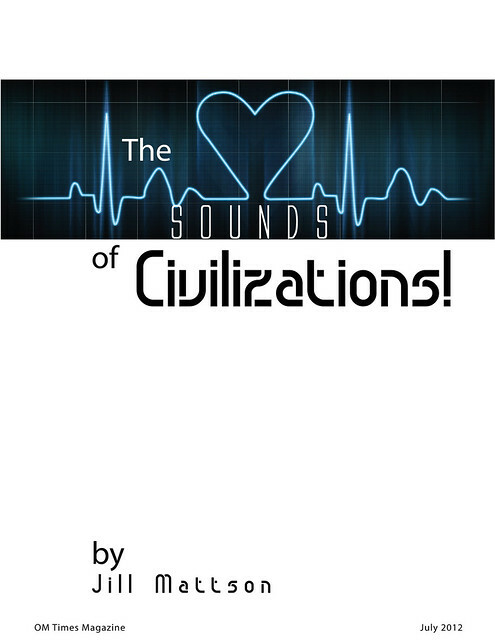 I have written numerous books on sound! What a powerful source of energy! Blessings jill"
"Jill, I love how you've added so much research on how sound affects more than the human species. I'm surprised sometimes how much noise some people are willing to endure. The noise on the outside is probably similar to the amount of noise…"
"I'll be there if you reserve a spot!" "Hi Jill, I noticed that you posted this in several different groups, in the future it would be great if you could just post it in the group that is most suitable to the material. That way three people aren't editing the article. Thank-you:) In…"
Unheard Sounds - Do they Bless us or Curse us? Jeni Powell liked Jill Mattson's discussion Unheard Sounds Do they Bless or Curse us?! Jill Mattson is a prolific Musician and Author who brings her deep spiritualism and intense curiosity and wonder to the many creative passions that she pursues. Jill lives to help others achieve personal growth and healing through her music, writings and art. Jill is a four - time author and widely recognized expert and composer in the emerging field of Sound Healing! She has produced six recent CD’s that combine intricate Sound Healing techniques with her original musical compositions – resulting in intriguing, magical tracks that also offer deep healing and growth possibilities. Jill lectures throughout the United States on “Ancient Sounds ~ Modern Healing” - taking followers on an exciting journey revealing the Healing Power of Sound. She unveils secrets from ancient cultures as well as the latest findings of the modern scientific community showing the incredible power and healing capabilities of sound. Jill draws on her extensive research of modern Sound Healing, and 20 year study of Antiquities and Secret Societies in her music, lectures, workshops and writings. Jill has produced and recorded numerous CD’s utilizing her classical musical training and Sound Healing techniques. Jill Mattson is an accomplished artist, musician, lecturer & author. She is a recording artist, with numerous CD’s using ancient and modern Sound Healing techniques. She has authored several books available from www.jillswingsoflight.com. She lectures on the topic sound, spirit and matter. Ms Mattson’s art is available at www.jillswingsoflight.com, redbubble.com/jillmattson, artist rising.and com/jillmattson. Music samples are available at www.jillswingsoflight.com, http://www.jillshealingmusic.com and myspace.com/jillswingsoflight. Blog at newagehealingmusic.blogspot.com. Intriguing complementary Sound Healing newsletter at www.jillshealingmusic.com. Videos on Sound Healing at UTUBE jillswingsoflight. Sound Healing with Flower Essences: Healing Flower Symphonies Vol. 1. The wind whistles, roars and purrs. It teases, soothes, or rips us with cold stabs to match its winter song. Poetic? Yes, but literally and subtly true. Ancient manuscript describe sound levitating heavy, perhaps aiding in the building of huge pyramids and monuments. 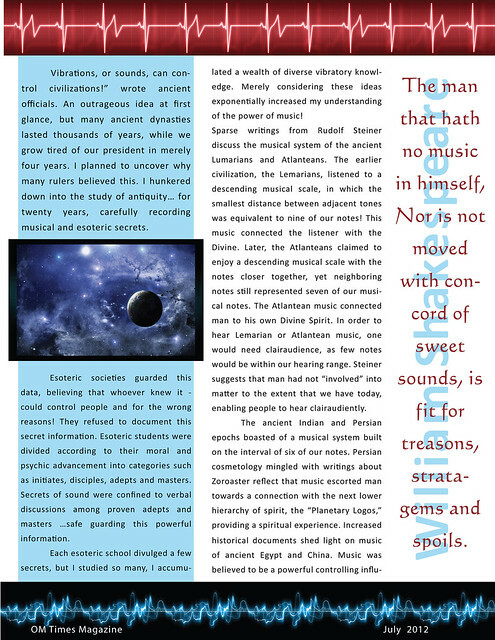 Ancient texts, all over the globe, describe sound as an effective method to move and alter dense physical matter. Do they Bless or Curse us?! Vibrations constantly change us! Many are so tiny in volume or out of our hearing range, that we are totally unaware of them. Unheard Sounds Do they Bless or Curse us?! Jill - I am predictably late but your article sounds great no matter what time of year. Emailed you / tried to friend you on fbook. And wanted to let you know how much I appreciate you sharing your wisdom and insight into the healing properties of music with US! 1. You posted your original submission under the Health & Wellness Group as a discussion - PERFECT! Above is the layout for the submission. Also - there has been some miscommunication about what we will be doing with the ARTist of the month and how we'll approach it etc. I will get with Darlene after we have actually got the details worked out. You will receive your information via a newsletter email and it will be posted on the site and most likely in the ART group(s). Sorry for any confusion - it's hard to get us all on the same page, when I posted in the ART group.. I was testing to see if there was interest. There have been no responses from the artists to my request - so we are still trying to figure out if this will be a feasible investment on our time and money. WE will be asking that the artists selected also engage actively to help us promote / sell / support their work. We will try to get the details up and something out soon for the entire community. Thanks again for your participation and willingness to collaborate and build! Darlene has spoke very highly of you and your work and we are all anxious and excited to get this part of OM up and flying. thank you so much for the friendship request!